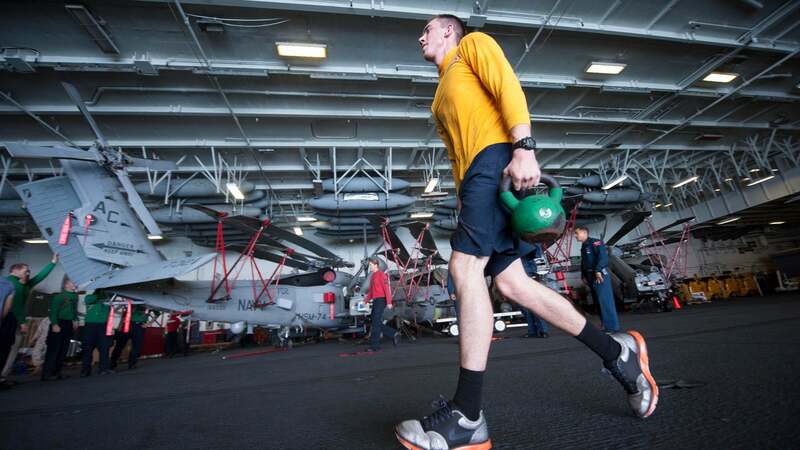 If you've ever walked with heavy objects in each hand a certain distance and couldn't wait to drop them by the end, then you've done a farmer's walk (AKA a loaded carry). It's one of the most basic and practical exercises, yet it also improves grip, core and total body strength while working on your cardio, all at once. You can hold a dumbbell, kettlebell, weight plate or 4L jugs of water even by your sides. The weight ranges between half and two times your body weight, but starting light is better. Then walk as far or as long as you want. It's really that simple, but it's not just about walking; it's how you walk with the weights (though different weights may change things ever so slightly). A proper farmer's walk begins with keeping your core tight, your shoulders back and a straight back. When you pick up the weights, you're essentially doing a hip hinge to pick them up. Think about standing tall, looking straight ahead, stapling your elbows to your sides and taking small, quick steps. The nice thing is that farmer's walks fit anywhere in a workout: As a warm-up, in-between sets or as your last exercise (a "finisher"). You don't need to overdo it though. Two or three sets per session should be more than enough.